Over the past few years, I’ve transitioned my career from government-oriented management consulting to the field of advanced analytics and data science. In general terms, this has required me to climb a significant learning curve in the related areas of computer programming languages and advanced statistical methods. While it has been challenging, the rewards of being able to more effectively and efficiently extract insights from various types of information/data is encouraging. With the objective of exploring my love of specialty coffee, I chose to practice a few basic data science methods on a relatively well-known specialty coffee review website: coffeereview.com . 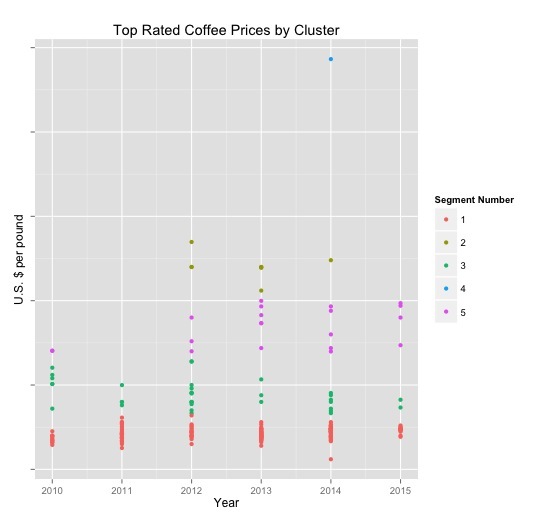 The goal was to apply web scraping, text analytics, segmentation, and some visualization techniques to coffee review data in order to explore correlations between price, producer country, roaster, and quality over time. My colleague and I discussed the objective over Memorial Day weekend and set out on parallel paths to scrape review data from the website. He used a Python script to scrape the website, and I used an R script to do the same. In the end, his Python script achieved a more efficient scrape, producing a column separated variable (.csv) file that could be imported into a statistical computing software package like SPSS or R.
From there, I cleaned up the file (using R packages such as “dplyr”, “stringr” and “sqldf” to get things to a point where we could calculate price per pound amounts and country of origin for most of the coffees reviewed. I was also able to pull down city/state location data for each of the roasters and their websites. One of my first business questions involved the type of descriptive language used to review the website’s top-rated coffees. 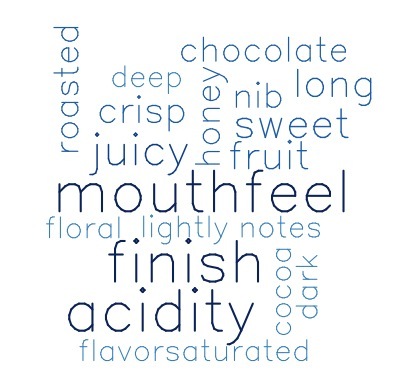 Where there any particular words that we could associate with the best rated coffee out there, according to coffeereview.com? A relatively straightforward way to investigate that question is to use a Word Cloud to illustrate the words with the highest frequency of mention in individual review comments. 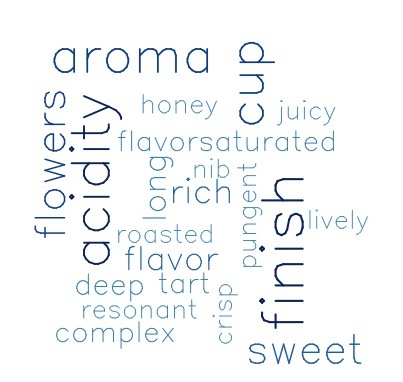 Most frequent words describing top rated coffees. 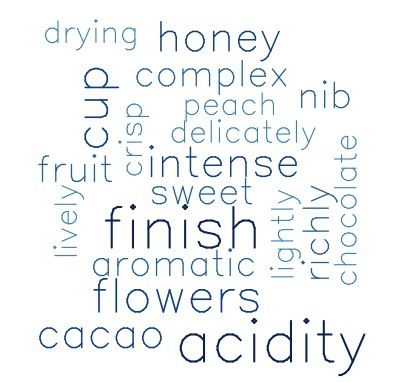 Clearly, if you want to appear to know the jargon for communicating your delight about a quality cup of java, you should say something like, “This coffee’s intense aroma of flowers, baker’s chocolate and fruit is only bested by its complex, rich flavor with tart tinges of acidity and a balanced, silky, syrupy, honey finish…”. Okay…so that sounds ridiculous…but you get the point. What is the range of ratings found on the top rated page? The maximum rating any single coffee receives on this page (of highest rated coffees) is 97, while the minimum is 94. There isn’t a lot of variance. Most of the top rated coffees are rated 94, a third are 95, and the remaining15 percent are either 96 or 97. We will revisit this data later. 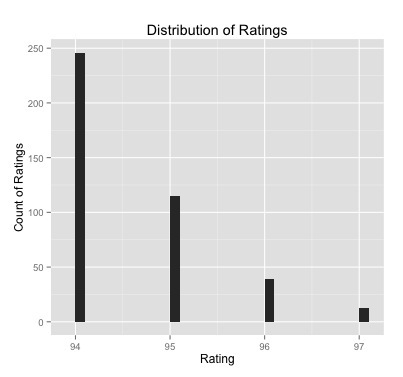 What years of ratings do we have the most robust data for in order to do more specific analysis on our variables? We decided to drop all years prior to 2010 (which had 29 coffees reviewed that year). Which coffee roasters were the most frequently reviewed and top rated by coffeereview.com between 2010 and roughly six months into 2015? JBC Coffee Roasters from Madison, Wisconsin was the favorite by far in terms of its 26 reviews on the website in the time span specified. Followed by Temple Coffee and Tea in Sacramento, CA (20) and PT’s Coffee Roasting Company in Topeka, Kansas (13). This was a surprise to me, as I have never sampled ANY coffee from these roasters and feel like I have been missing out. In order to show the table of roasters, i used the combination of R packages “RGraphics” and “gridExtra” to save some nice incremental (sets of 15) graphics. 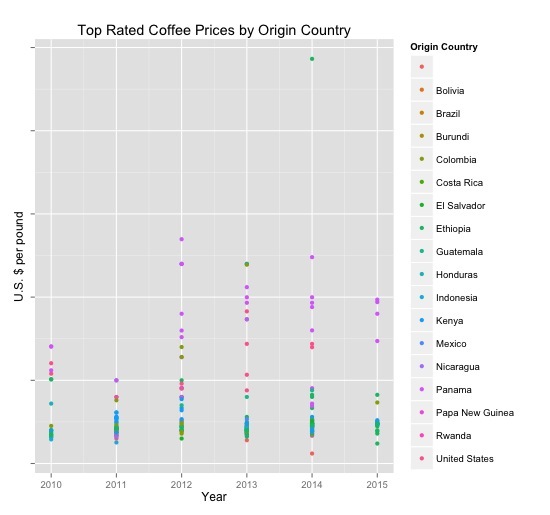 A quick visualization of the top rated coffees by year, price per pound and origin country shows some semi-distinct segments within the data based on price alone. This led me to ponder if we could use a clustering algorithm (such as k-means using dummy variables for each country, price per pound, and rating) in order to more clearly segment particular coffees by segment. Instead of using R for this exploration, I exported the data into a .csv and imported it into SPSS to run the analysis there. Price per pound by origin country and year ($US). United States = Hawai’i. A five-way cluster solution seemed the most suitable for segmenting the data in a way that illustrated differences across price and producer country. Price unreasonably drove the segmentation, as seen in this graphic. After exploring the data in this way, I wondered if 1) my approach to segmentation was appropriate 2) what the comments from these segments looked like comparatively. To answer the first question: no, but that will be the topic of my next blog post. 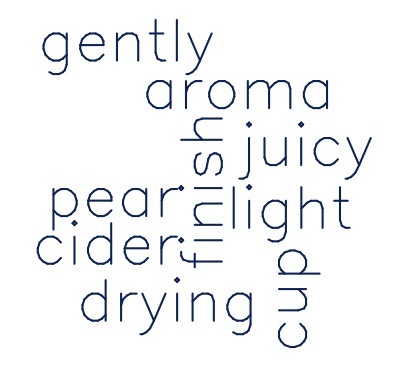 To answer the second, let’s explore some word clouds below. 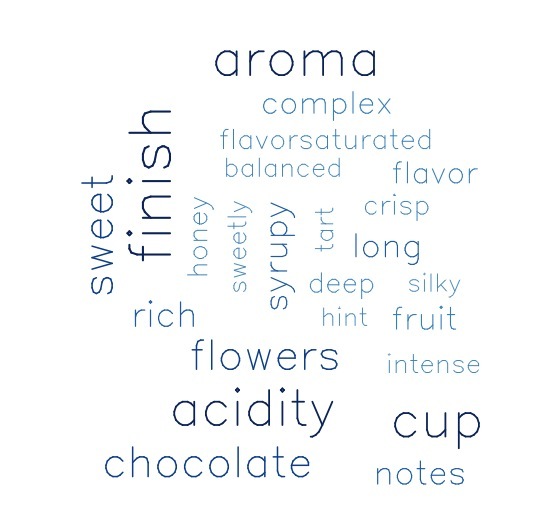 Perhaps clustering by cupping notes is a better way to segment groups…stay tuned. Unfortunately, I enjoyed Café Samba so much that I’ve barely even took a photograph of the place, though having frequented it on many occasions spanning from 2006 to 2010. It is difficult to state what the best part of the lounge/cafe/bar located on the Septima is: the coffee products, natural juices, and cocktails are simply the best in that part of Bogotá; the moderately sized food selection is equally impressive in quality. They make the most of what they have when it comes to ambiance of the place (lounge feel even without the chic lounge budget of the Chico and Parque 93 neighborhoods). Service is superior for the price range and the couch located at the front of the shop always seemed to be reserved for me. Also, the clientele is an attractive youngish blend of professionals and students. My favorite item on their menu would be a fresh blended non-alcoholic natural joice cocktail of Maracuya, Mango and Orange Juice mix. The quality of their coffee is above average for a country that exports the majority of their high quality beans. They use a high quality vintage Elektra espresso machine and decent coffee roasted in country. I imagine they could improve their coffee quality if they sourced their coffee from a better roaster. Musically, this café makes an impression on locals and visitors alike considering the high quality sound system wired from wall-to-wall and mounted in the ceiling. The “DJ” tends to be whatever barman has a free moment. Luckily, all have terrific taste when it comes to selecting a good playlist. If you make it to Colombia, Cafe Samba is well worth a stop along the way. Cafe Hounding: Azi’s Cafe – Washington, D.C.
Azi’s Café is a wonderful place to grab a coffee and a meal in one of DC’s most diverse and dynamic neighborhoods – albeit not very commercial. The charming owner, Azeb Desta (nicknamed Azi), hails from coffee’s disputed birthplace in the Horn of Africa. Before opening Azi’s in 2005 she worked for eleven years in food and beverage with Ritz-Carlton hotels. 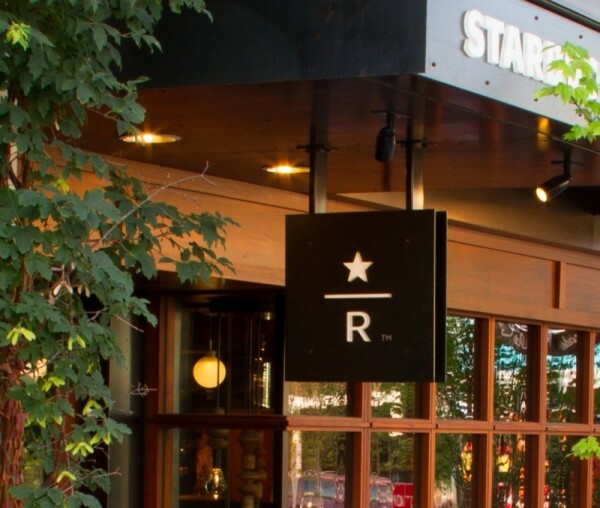 Her location at the corner of 9th and O streets is smack in the middle of a rapidly changing area of the Shaw area of DC, where an improving standard of living and an aversion to the normal “Starbucks” options appear to partially drive traffic to Azi’s Cafe. Perhaps more important, Azeb and her staff are some of the warmest and most dedicated employees in the business and their service clearly helps with customer loyalty. Furthermore, for the time being, there is very little direct competition in the immediate area. The menu of light food fare boasts decent pastry, soup, salad and panini (the roasted turkey breast, tomato, cheddar, and garlic spread goes for $6.50) options. Personally, I often find myself succumbing to the flavorful biscotti displayed in large glass containers in front of the cashier – it perfectly compliments a warm frothy cappuccino on a cold day. Generally, the coffee is above average for Washington and I’ve grown fond of their cappuccinos. They use Illy coffee and have a stand of retail Illy for sale proudly exhibited in their front window. Having sampled an Illy espresso across town at the Illy shop at the Renaissance M Street Hotel, I was excited to see how Azi’s compared. The coffee itself was definitely up to par, bold and complex from start to finish. The cup they used in my case was a designer Illy cup – of my choosing – that was plenty warm from sitting atop the French-made UNIC machine. The quantity of crema was less than sufficient, though, and I would have to wager the guess that the machine could be the problem. I’ll undoubtedly try another espresso here before making a final judgment on the quality of their coffee and ability to make drinks. It also appears that they keep a pretty steady line of customers asking for both specialty drinks and regular cups of coffee during this time of year. I’ve never visited this locale without a pleasant and eclectic mix of music weaving through the small locale. The southern wall is littered with a few electric sockets for those who tote laptops and have a use for their free wi-fi. Others may choose between a few tables in the middle of the shop and a couple two-seater tables squeezed in between columns with plenty of natural light on the northside of the shop (sorry, no electric plugs on this side of the shop). Whether for a hot bowl of soup, a freshly made salad, a steamy latte or a shot of espresso – Azi’s is quickly becoming an institution in the Shaw neighborhood and – with over five years of business in this locale – Azeb Desta seems satisfied that things are going in the right direction. Although, she thinks that the last five years have gone by quickly, and that both the neighborhood and the clientele have changed equally quickly. Azi’s Café is one of very few businesses thriving in this section of NW and it will be interesting to see how much/little she changes in the next five years in order to maintain a successful enterprise. Café Hound will undoubtedly continue to frequent her shop and wishes her the best in growing her business. In my relatively limited experience, providing high quality coffee in terribly hot and humid conditions is usually an EPIC FAIL based on my experience with several of the coffee barons in Managua, Nicaragua. That said, Juan Valdez has managed to keep its product consistently above average (though not excellent) everywhere that I have tried it. This includes the city center in Santa Marta, Colombia. They also provide paying customers with 30 minutes of free wifi (if requested) and have a variety of tasty baked treats to go along with their splendid coffees. They probably do better business with their cold drinks here in Santa Marta, but also do a decent job of selling and preparing their hot ‘pod’ drinks and single and double shot espresso drinks. My girlfriend thoroughly enjoyed their Cheese/Bread Stick (Palito de Queso) and also the Almojabana (which reminded her of the delicious Brazilian treat Pao de Queijo). The seating at a Juan Valdez is always comfortable and intelligently situated to provide for the right combination of privacy and social interaction – a key element of Colombian culture. The Juan Valdez in Santa Marta attracts the local color – musicians and other interesting characters – who come to entertain the heavily foreign (read: German) tourists who setup camp here to practice their Spanish and regroup after excursions in and around the Department of Magdalena. Overall Juan Valdez rarely fails to deliver on the customer expectation for a special and above average experience with above average coffee. Oma cannot compete with Juan Valdez on a national level and this fact is only cemented by positive experiences like the ones I had at the Juan Valdez in Santa Marta. I hope they keep up the good work – and continue to send good merchandise to the DC shops so I can continue to buy their shirts and travel mugs when visiting the Organization of American States! One such tourist destination in Magdalena is the small fishing town east of Santa Marta by the name of Taganga. Taganga is most known for offering affordable and decent quality scuba diving lessons/certification classes to tourists traveling through this tropical outpost in Colombia. In Taganga, my friend and I happened upon the self-proclaimed “Nicest Little Coffee Shop in the Southern Hemisphere” – which I had to put to the test. We meandered in, after being followed all the way to the door by a local stray dog looking for some air condition and table scraps. The atmosphere was definitely cool, bohemian, and welcoming to the backpacking tourist hailing from Europe (judging by our company inside). The Left-leaning Aterciopelados blared on the radio and our bohemian waitress/barista took our order after we evaluated their very lengthy menu on the wall for several minutes. My first inclination was to request the gold standard for a coffee shop – espresso please. But, I hinted to my friend that the machine was not running (likely to save electricity) and that if they were to pull my shot immediately after turning on the machine, it would be of the worst quality with no crema whatsoever. My prediction was 100% correct – despite the coffee being from a local cooperative of indigenous growers who sell their coffee through designated ‘Casa Indigena’ – indigenous cooperative trade associations (such as this one http://intermundos.org/sierra_nevada1.htm). I suspect that the coffee quality is better than my espresso reflected, so I encourage additional research. On a side note, the iced tea that my friend ordered was also surprisingly unpleasant. Sadly, it appears that the biggest sell here was that they have English speaking staff, English marketing materials, free wi-fi (that cuts out a lot), and a HUGE menu. Quantity, not quality. Also of note, the prices were expensive even relative to coffee shops in DC and California. Positively, the cozy bohemian feel becomes quite endearing and familiar as an ex-pat in Colombia. Next time I visit Taganga, I will probably stick with the fresh fish and fresh juices consumed under a straw hut overlooking the bay. Santa Marta and the surrounding areas are quaint, safe and beautiful. I highly suggest visiting! Looking out over the bay in Taganga while waiting for my freshly caught Red Snapper to be served. Another interesting side note – much of this little town’s wealth came from ‘seed money’ in the 70s as a result of the lucrative illicit marijuana trade to the US. Local traquetos laundered the money by investing in real estate, agro-industry, and boosting the local tourism industry. The U.S. market has long since moved to closer producers (British Columbia, Mexico, California) to meet domestic demand and Taganga appears to rely mostly on tourism as its lifeblood. Cheers. Don Pedro's interior from the back room looking out towards the adjoined bakery run by Pedro's wife. Cafe Don Pedro is one of those places that began Maher Hound’s entire journey into the coffee world. An exercise in objectivity would be senseless in this post considering my first encounter with the wonderful Colombian grown stimulant known as Cafe Don Pedro began in the late nineties after my father received a pound as a gift from a friend stationed at the US Embassy in Bogota. At the time my family did not find the coffee particularly amazing and I was too young to have taken up the habit of coffee drinking full-time yet. Several years later, after being reintroduced to Colombian coffee through a chocolate covered experience with Oma coffee, I found my way down to Colombia and into the storied retail location of Cafe Don Pedro on Calle 90 where it intersects Carrera 11A. Beyond having one of the most folkloric, traditional coffee themed interior designs I have ever seen in a coffee shop; Cafe Don Pedro had very well trained and highly knowledgeable staff that were able to describe everything about the entire supply chain process of a coffee plant/bean and how to prepare beverages with care and with style. My first visit to Cafe Don Pedro in the flesh was in 2006. This was before I had been properly introduced to cupping and understanding the careful and lengthy process of training one’s palate to distinguish subtle discrepancies in the flavor profile of different beans and brews. Even at this early juncture of my coffee loving career, I knew I had come across a truly amazing quality of coffee. Upon my departure from Colombia several months later I carried several pounds of the delicious substance with me (beans were packaged according to their Department (a national sub-unit similar to a State) of origin). The most well-rounded beans sold by Don Pedro were probably the Cudinamarca blend – taken from the region immediately surrounding Bogota. The most unique and distinctly (although quite mild) beans were those from Huila, found south of Neiva heading towards the Colombia-Ecuador border on the 45 highway. The Huila beans – last time I tried them in 2008 – had a vanilla and nutty undertone in the finish that was preceded by bright orange acidity in the initial sip. Upon my return to Colombia in 2008, I made another stop at Don Pedro and enjoyed the comfortable ambiance and coffee of the shop. Did I mention that, because they roast coffee every day right in the front of the shop, there is an overwhelmingly pleasant aroma of fresh roasted coffee that greets each customer upon entering the shop? In 2008 I sat down and discussed the business – both the beauty of owning one’s own specialty coffee retail location in a country dominated by the Juan Valdez and FEDERCAFE image AND the problems associated with trying to leverage the international recognition of the Juan Valdez label while trying to directly export one’s own brand to international markets. It appears that Pedro de Narveaz is still wrapped up in a legal dispute with the National Coffee Growers Federation in Colombia and this will likely – due to the political clout and financial resources of the Federation – end badly for our beloved Don Pedro. Despite these facts, his business does incredibly well just by selling to the Bogota equivalent of Washington, D.C.’s ‘Embassy Row’ with high praise coming from the US Embassy in Bogota and his own product positioning in Bogota’s El Dorado International Airport for those hoping to grab a bag of Don Pedro before hopping on the plane. I returned yet again to Don Pedro in July 2010 to grab five pounds and sample a delicious espresso with my girlfriend. As she enjoyed her cappuccino with ‘fluffy foam’ and delicious coffee cookie treats, I reminisced about the more than four years of coffee patronage at this wonderful location in downtown Bogota. Now, with the store moving down the street into a smaller shop on Calle 89 with 11A, I am both saddened and excited about the future of the Cafe Don Pedro experience. The new commerce brought to this neighborhood by the incoming Mall will definitely boost foot traffic in and around Cafe Don Pedro, but it will also dramatically alter the quiet and charming experience that this neighborhood offered the older Bogotano crowd looking for an elegant cafe to discuss Colombian culture, society, politics and – most importantly – coffee. Gently kissing this cup of C-marca espresso blend goodnight on my last evening in Bogota in July 2010.